Aviva after the war in 1950. Aviva Goldschmidt remembers every day the fear of being a small child who learned that any sound she made could mean discovery and death.”You may not cry; you may not laugh; you may not talk; you have to be absolutely quiet.” Her mother’s constant warnings still echo in Aviva’s heart today. They also saved her life. Aviva and her mother survived the Holocaust in various hiding places in Boryslav, Poland (today in Ukraine). A sound, a word, a sob could have revealed them and delivered them to their deaths. Her mother’s admonishments had such an impact on little Aviva that even long after the Holocaust, she was only able to speak in whispers. 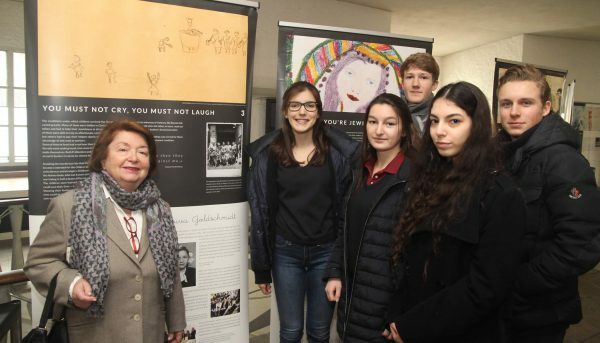 On International Holocaust Remembrance Day, Aviva told her story to about 100 high school students in Frankfurt, Germany as part of a Claims Conference commemoration and exhibition that focused on child survivors of the Holocaust. Aviva Tuch was born in 1938 in Boryslav and lived with her parents Mendel and Pinia and older siblings Cilla and Josef. The family had a comfortable income. But Aviva’s sheltered childhood came to an end with the Nazi invasion of the Soviet Union in June 1941. Mendel Tuch was deported for slave labor; his family never saw him again. They heard later on that he had been shot. Cilla fled eastward into the Soviet Union. 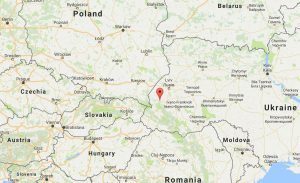 Aviva and Josef together with their mother were brought to the Boryslav slave labor camp, from which they managed to escape. Until liberation they lived in hiding in various places in and around Boryslav, giving Aviva the strong memories of orders to be quiet at all times. During the last days of the occupation, Aviva’s brother Josef was shot to death by German soldiers at age 20. 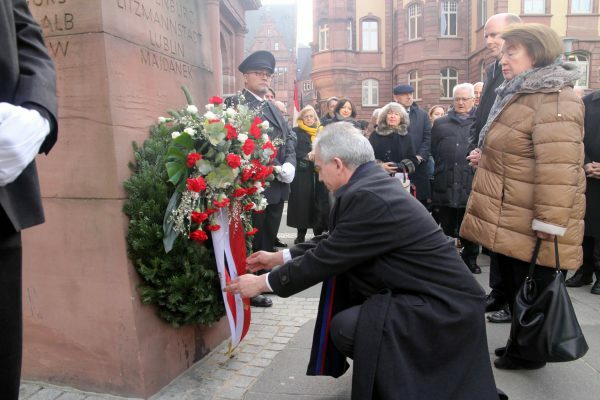 At the Frankfurt commemoration, Aviva told the students that she still suffers from trauma and that the memories of the Holocaust are always with her. One of the students asked if when moving to Germany in the 1950s, she experienced anti-Semitism and how she would judge the situation today. Aviva said that anti-Semitism in Germany is more visible today, and that she worries about the rise of right-wing populism all over Europe. She appealed to the students to strengthen democracy. For Holocaust Remembrance Day, the Claims Conference held an exhibition, “Jewish Child Survivors,” at St. Paul’s Church, a venue used for important city and regional events. We displayed banners about the plight of child survivors and individual stories, including Aviva’s. As recognition of her persecution and the suffering she endured, Aviva receives payments from the Article 2 Fund, and received a payment from the Child Survivor Fund. 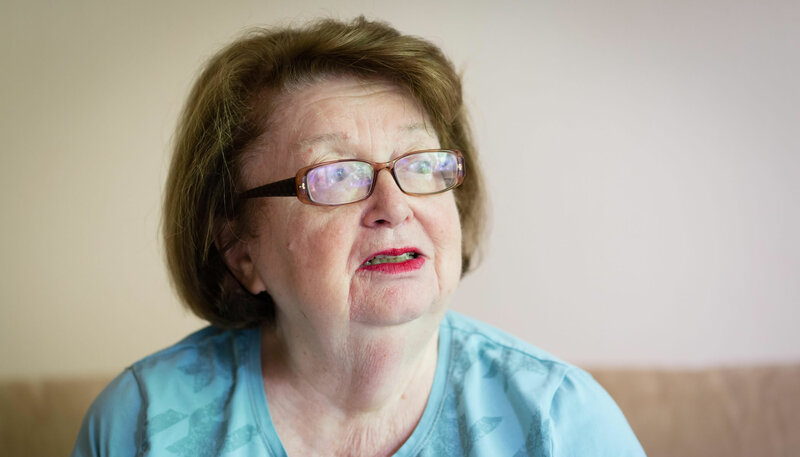 On a day when the world remembered the six million Jews who were slaughtered, it is important that people, especially young people, hear the stories of individuals like Aviva. The number six million is often too large to grasp. But a story of a small Jewish girl terrorized into speaking only in a whisper, even years after the war, resonates and stays with the people who hear it.